Rotorua will get the opportunity to exhibit its natural wonders as well as the best Touch players from New Zealand and Australia as they meet for the highly anticipated, 2018 Open Trans-Tasman Series. 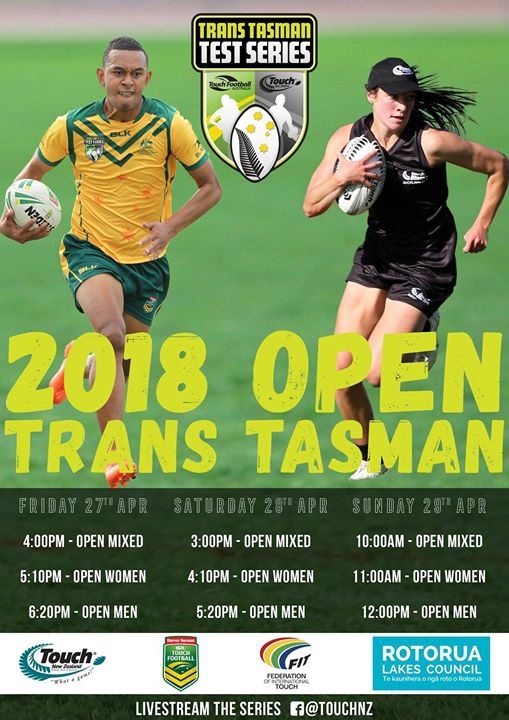 The two Nations will battle it out at Rotorua International Stadium from Friday 27th April, to Sunday 29th April 2018 across three Opens grades; Mens, Womens and Mixed. With the impending World Cup in Malaysia in 2019, this is the prime opportunity for teams to showcase their skill and dynamicism at the highest level possible whilst they aim for the series win over the 3 days. With New Zealand and Australia well known for their long-standing rivalry, there is no doubt that the Series will be filled with spectacular action and show stopping performances.